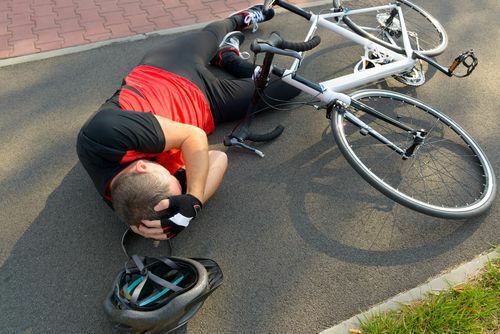 Bicycle Collisions and Traumatic Brain Injuries Just because a cyclist is wearing a helmet doesn't mean they can't suffer a concussion or traumatic brain injury if they have been in a collision. Bicycle collisions present a high risk of brain injury because the rider is completely exposed during an accident. 75% of all bicycle deaths are caused by head injuries. The dangers of brain injury and death increase with speed and when the collision involves a motor vehicle. In the event of a crash the rider is often thrown forward or to the side where the head is likely to hit the hard ground or whatever objects may be in the way. 85% of head injuries on bicycles can be prevented by simply wearing a helmet. What many don’t know is even if you are wearing a helmet, you may still be at risk of brain injury for various reasons. The goal when fitting a helmet is for it to comfortably touch the head all the way around and be stable enough to stay put when facing shakes, bumps or even a blow to the head. This may require adjusting your straps so the Y fits snugly around your ears and the chin strap is tight enough for you to feel a slight tug when you open your mouth wide. Don’t forget to fasten the buckle! Remember: Not every helmet is made to fit all the different shapes and sizes of heads. You may need to try different styles to find one that works for you. If it wobbles, bounces or doesn’t feel right, don’t buy it! If your helmet has already done its job and protected you in a crash or fall, it is time to replace it. The foam part of a helmet is designed to protect you just one time. After it has been crushed or cracked, even just once, it is no longer safe to wear. Additionally, helmets should be replaced every 5 years or so. If you are unsure about your helmet because of its age, wear or an accident, check with the manufacturer to see if they will examine your helmet. Many will do so for low cost and some even replace it after an accident. Did you know many of the helmets sold today are not designed to prevent concussions? Helmets were originally designed to prevent skull fractures by cushioning direct blows to the head and preventing penetration into the skull and brain. They are great for those purposes, but many do nothing to prevent other life altering brain injuries like concussions. Brain surgeons and scientists teamed up to create a Multi-Directional Impact Protection System (MIPS) helmets to specifically prevent concussions. MIPS helmets have a soft layer inside the helmet to allow slight movement of the helmet upon impact. This breaks the blow of an angled impact and directs the force away from the head. In our view, even if the technology doesn’t guarantee you won’t suffer a concussion, it is worth decreasing the odds of one. Helmets protect your brain from impacts, not from force. Think of it this way, if you hit your head, the helmet will break the impact, but if your head is shaken violently, the helmet will simply shake with it, leaving your brain to slam into your skull. Helmets simply cannot protect you from sudden and violent movements that can damage the brain from inside the head.